To commemorate the 350th anniversary of Sir Hans Sloane’s birth, Chelsea Physic Garden celebrates its special link with Jamaica with an Independence Day Celebration on Friday 6th August 2010. Chelsea Physic Garden is London’s oldest Botanic garden, established in 1673, and owes its continued existence to the generous rental agreement of Sir Hans Sloane. Just £5 a year is paid to the Garden’s landowner, now Earl Cadogan. Sloane, most famous as the founder of the British Museum, wrote ‘A Voyage to Jamaica’ having lived on the island for nearly two years in the late 1680s. It is one of the most important early natural histories of the island. To commemorate the 350th anniversary of Sloane’s birth Chelsea Physic Garden celebrates this special link to Jamaica. This summer a large area of the Physic Garden has been transformed with plants found in a Jamaican ‘Provision Ground’, the land where Jamaican people traditionally grow food crops. Music all day from The Roots Collective fuses worldly and eclectic sound influenced by lead singer/guitarist’s Segun’s Jamaican roots. Plus a special guest appearance to be announced. The Garden’s acclaimed Tangerine Dream Café will be serving the famous Jamaican dishes Jerk Chicken and Rice ‘n Peas, and Jamaican Ginger Cake and Red Stripe Rum Cocktails. 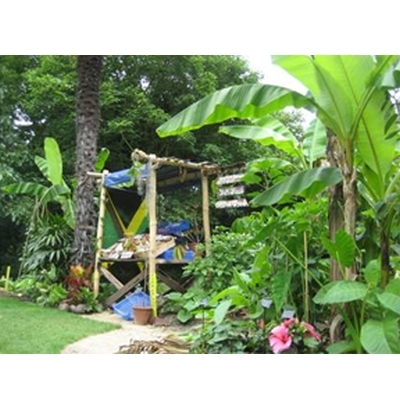 The best three mobile phone photos of the Jamaican Provision Ground sent to Chelsea Physic Garden Twitter by end of August will win a year’s joint membership of the Garden and the top photo will also receive a copy of the book ‘Absolutely Jamaica’. The Garden is also interested in hearing from people with Jamaican roots their Jamaican Remembered Remedies.